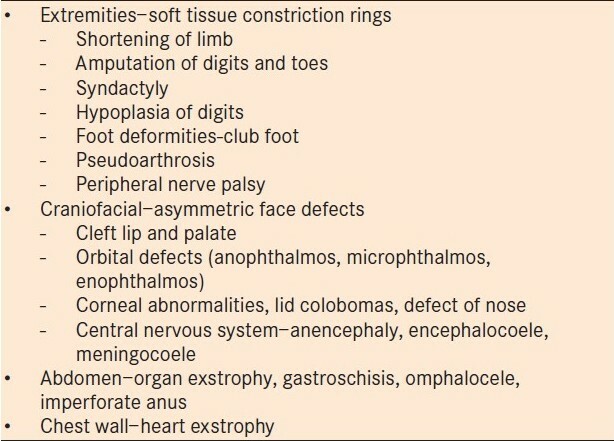 Amniotic band syndrome manifests at birth with a variety of malformations ranging from constriction ring to defects incompatible to life, in various parts of the body. Although some theories have been proposed for the development of this syndrome, the exact cause remains unknown. The median facial cleft is an extremely rare manifestation of amniotic band syndrome with a relative paucity of reports available in the literature. Here, we report one such case. Amniotic band syndrome (ABS) is a spectrum of asymmetrical congenital malformations due to ring-like constrictive bands in the limbs, head, face, or occasionally the trunk. The incidence of this syndrome ranges from 1:1200 to 1:15,000 live births. Nearly all cases are sporadic, and cases of familial transmission are rare. The exact etiology of the syndrome remains unknown. In 1930, Streeter proposed the "intrinsic theory" of germ defects in the embryonic disc as well as the amniotic cavity. However, the widely accepted "extrinsic theory" proposed by Torpin and Faulkner (1965) hypothesizes separation of amnion from the choroin during early pregnancy which produces free-floating tissue bands. These amniotic bands either wrap around parts of the embryo in a band-like manner or are swallowed by the fetus. The bands restrict growth or cause structural defects in the fetus. These bands are also the most frequent cause of facial clefts by creating pressure necrosis or interruption of normal fusion in the facial processes. We report a case of ABS with median facial cleft. A 1-day-old male neonate presented with respiratory distress and bifid nose. The baby was the first born to a 24-year-old mother and was delivered full term through normal vaginal birth. His birth weight was 3.0 kg. Maternal obstetric history was not suggestive of any antenatal insult to the fetus. Family history revealed no consanguineous marriage or history of congenital malformation. On gross inspection of the face, there was a bifid nose with severely stenotic nostrils, cleft palate, hypertelorism, a microphthalmic right eye, and coloboma in the left upper lid [Figure 1]. Probing of the nostrils revealed a small cul de sac. The baby had constrictive circumferential grooves in both lower limbs and right second toe [Figure 2]. The right foot had amputated great toe. The left hand showed syndactyly of the fourth and fifth fingers. No other abnormalities were found on routine systemic clinical examination. Initial stabilization was performed via orogastric aspiration, and maintenance of airway and oxygenation. We planned a multidisciplinary surgical approach for reconstruction of the face; however, the parents left the hospital with the baby on a risk bond. Most of the cases of ABS are sporadic with no recurrence in siblings or children of the affected adults. Though exact etiopathogenesis of band formation is still unknown maternal trauma, oophorectomy during pregnancy, intrauterine contraceptive device, amniocentesis, and familial connective tissue disorders are some of the suggested risk factors for the development of ABS. These bands produce varying degrees of polymorphic clinical findings ranging from superficial circumferential grooves in the skin to amputation of part or whole of a limb. The morphogenesis of facial clefting in ABS is not well understood and is a topic of much debate. 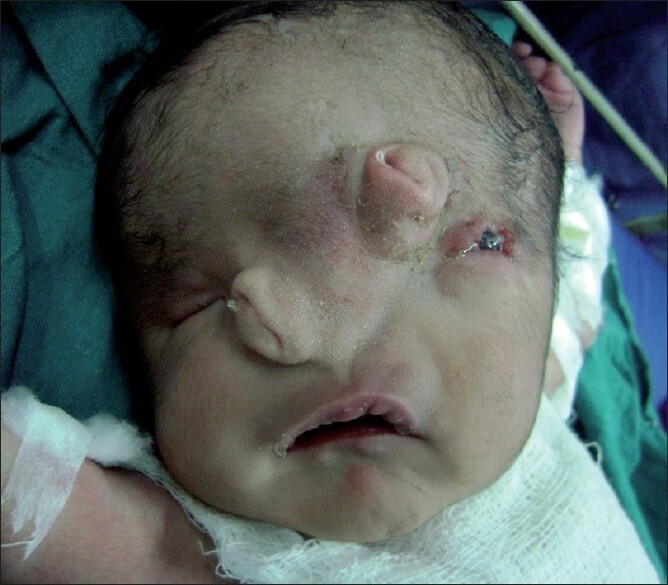 The multiple, polymorphic, and asymmetrical facial malformations are may be due to swallowing of amniotic bands by the fetus. Johnston  and Wetson,  however, suggested failure of migration or degeneration of neural crest cells are responsible for cleft formation. Tessier in 1976 had simplified cranio-facial clefts classification from 0 to 14, beginning at 0 in the midline of the lower face and progressing clockwise around the right orbit ending at 14 in the midline of upper face that has been universally accepted. Losee et al. in 2004 simplified and classified congenital nasal abnormalities into only four types. Median facial cleft syndrome is included in Type III and results due to failure of fusion of the medial nasal processes. Median facial cleft corresponds with Tessier cleft No. 0 or 14 and Tessier cleft No. 9, 10, 11 are associated with upper lid coloboma. The upper lid coloboma may be the result of amniotic band traction on the lids. The malformations of ABS are summarized in [Table 1]. , ABS should be included in the differential diagnosis of all complex asymmetrical malformations of extremities, face and body wall, e.g., amniotic folds, short umbilical cord syndrome, and extra-amniotic pregnancy. In our case, the baby had Tessier cleft No. 0 and 10 with constricting bands in both lower limbs and the right second toe with autoamputation of the great toe and syndactyly of the left hand. As neonates are nasal breathers, simultaneous sucking and breathing lead to respiratory distress. Temporary measures such as oral airway and orogastric feeding are successful for neonates. Canalization of the nasal passage and tracheostomy are other options on the basis of the severity of neonatal respiratory distress. Surgical reconstruction is very demanding and requires a multidisciplinary approach. 1. Verma A, Mohan S, Kumar S. Late presentation of amniotic band syndrome: A case report. J Clin Diag Res 2007;1:65-8. 2. Matic A, Komazec J. Amniotic band syndrome. Acta Medica Medianae 2009;48:44-8. 3. Braude LS, Miller M, Cuttone J. Ocular abnormalities in the amniogenic band syndrome. Br J Ophthalmol 1981;65:299-303. 4. Higginbottom MC, Jones KL, Hall BD. The amniotic band disruption complex: Timing of amniotic rupture and variable spectra of consequent defects. J Pediatr 1979;95:544-9. 5. Torpin R. Fetal malformations caused by amnionrupture during gestation. Springfield: Thomas; 1968. 6. Bouguila J, Ben Khoud N, Ghrissi A, Bellalah Z, Belghith A, Landolsi E, et al. Amniotic band syndrome and facial malformations. Rev Stomatol Chir Maxillofac 2007;108:526-9. 7. Johnston MC. The neural crest in abnormalities of the face and brain. Birth Defects Orig Artic Ser 1975;11:1-18. 8. Wetson JA. A radioautographic analysis of the migration and localization of trunk neural crest cells in the chick. Dev Biol 1963;6:279-310. 9. Tessier P. Anatomical classification of facial, craniofacial, laterofacial clefts. J Maxillofac Surg 1976;4:69-92. 10. Losee JE, Kirschner RE, Whitaker LA, Bartlett SP. Congenital nasal anomalies: A classification scheme. Plast Reconstr Surg 2004;113:676-89. Schramm, C. and Rohrbach, J.M. and Reinert, S. and Mau-Holzmann, U.A. and Aisenbrey, S. and Bartz-Schmidt, K.-U. and Besch, D.